Joe, Mike, and Sean cover the past week or so's worth of news. Hey, that stupid velociraptor costume! Disney Hollywood Studios' 25th anniversary 'events', as we relive what the park could have been. Soarin' over the Horizon? Seven Dwarfs things. Disney Springs rumors and our concepts. Hey, a bunch of VPs got shuffled around at WDW and WDI! 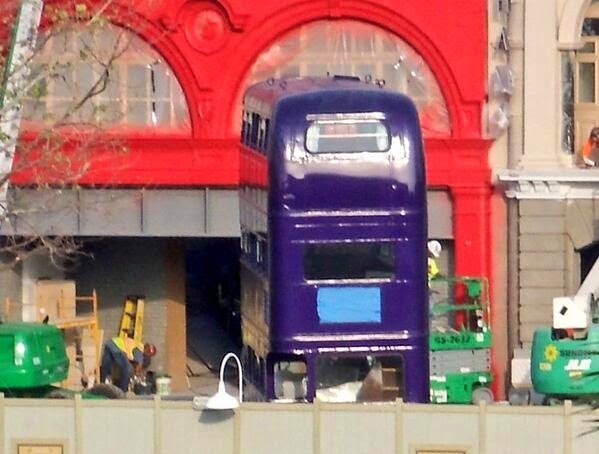 Diagon Alley rumors, and how the coaster didn't derail (idiots). 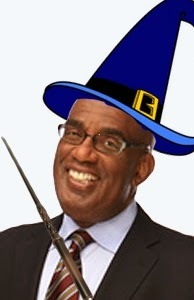 Al Roker, PR battles, and ROCKS! Finally we close it out with your questions. Joe, Nick, and Sean are joined by Derek Burgan from TouringPlans.com to discuss tips, tricks, and hints for those visiting the Universal Orlando for the first or 100th time. 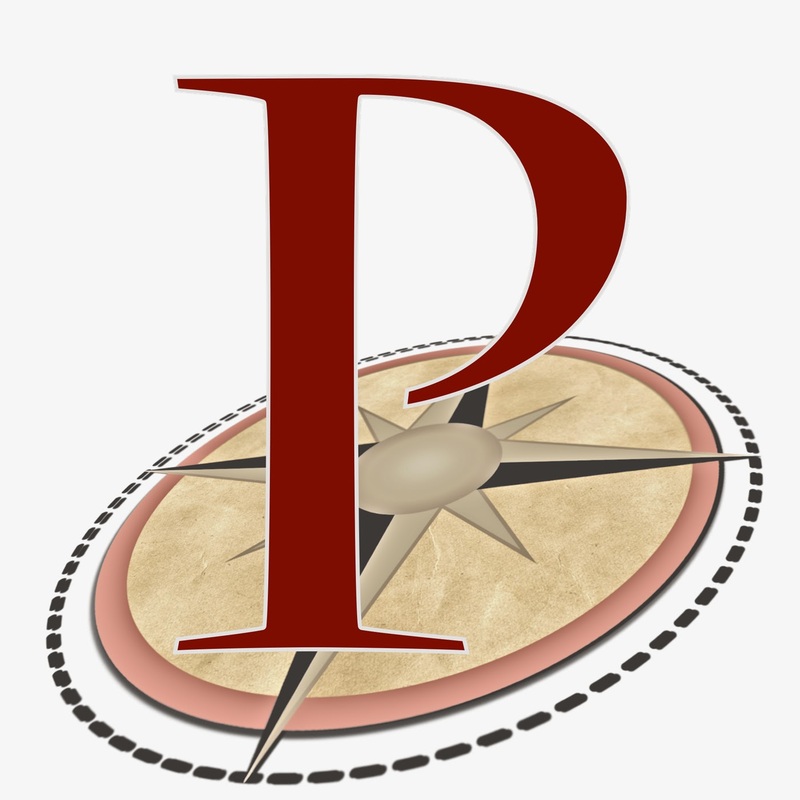 Email us at parkscopeblog at gmail dot com or follow us at Parkscope, ParkscopeJoe, ParkscopeNick, Parkscope_Sean, or Derek Burgan. We tackled the big two Universal topics: night time in the parks and screens. We then also discuss London waterfront and take your questions. This is what will happen if Universal Orlando doesn't plan out their crowd control. We’re quickly approaching the opening of The Wizarding World of Harry Potter - Diagon Alley later this summer so I’d like to cover how Universal Orlando could possibly handle the crowds. This is speculation based on rumored attractions, capacities of said attractions, Universal's handling of prior Potter crowds, and my personal experience. 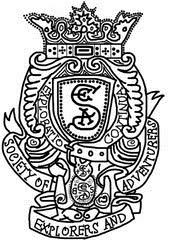 This post has been updated several times with new information, striking out incorrect things, and updating photos. First, lets discuss Hogsmead’s opening. The land opened to massive crowds that started arriving at midnight. Inside the Magic has two fantastic posts worth reading to understand the crowds and the systems set up for that day. The take away is Universal clearly was not expecting the crowds it received. IoA and CityWalk became queues, and simply getting into the park would take four hours. Lets discuss where the problems were. Poor communication: Universal security team members were reportedly not told about the correct procedure for letting guests into the park till the night before. Pessimistic Attendance Expectations: While Universal opened the parking garages early, they did not expect CityWalk to become a queue line. Poor Waiting Systems: Queues only, and queues that were not pre-defined. The queues became self regulating, which would work with an iPhone launch, but not when hundreds of thousands of guests are trying to get into a theme park. The opening day of WWoHP was not unlike the launch of a major, online only video game: the largest amount of guests to ever use the system all want in on the first day. Any system or procedure will be designed to handle the vast majority of situations, not extreme outliers such as opening day. In the following months the crowds subsided and Universal incorporated additional crowd control solutions. Our friends at TouringPlans.com have great write up in the Unofficial Guide to WDW and Beyond Disney books on these systems and how/when they’re implemented. There are two situations: a ticketing system similar to FP, and opening free-for-all. 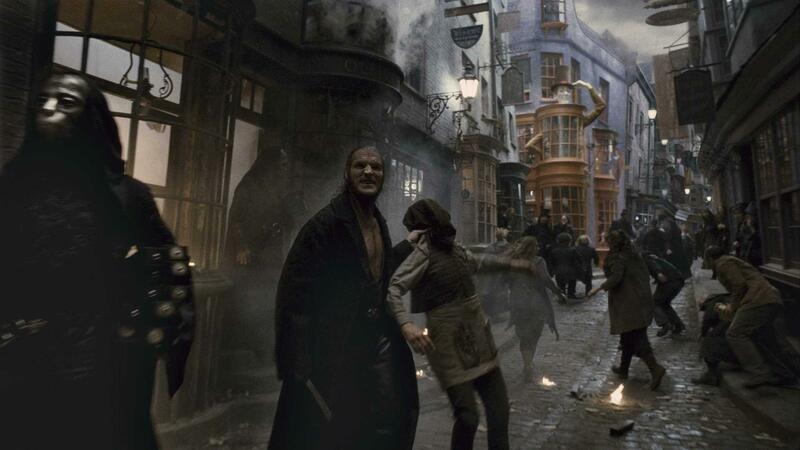 So lets break out the Diagon Alley crowd control speculations down to what we can expect. NOTE: this is all based on my work with queues, crowd control, and processes. I have no inside information regarding the opening day crowd control from the Universal Orlando folks. Universal has not yet announced an opening day, but a mid-June opening is expected. It’s very possible Universal is going to try and mitigate the long lines from Hogsmead’s opening by spreading an opening day to an opening week, or not having a a public grand opening at all. While the lines make for good reports and buzz, it leads to poor customer satisfaction and does not make long term, return guests. Massive Queues, Organized Chaos: This would be a similar situation as from Hogsmead opening, but with far more planning. Garage will probably be open at 5:30am, earlier, or even for 24 hours before opening. Set queue lines in USF. A small switchback in front of the London facades and around the fountain. Queues will be defined by marked lanes, will be staffed by Team Members and Security to prevent line jumpers. Red: Main queue, most likely option. Makes its way around USF and then uses the Disaster extended queue (minus any HHN construction) to host guests. It's also possible that the Disaster queue will be use for overflow for the Hogwarts Express. Green: Uses the Fear Factor Live building as a queue space. Unlikely as USF has not put the attraction down for refurbishment or closure and they will need more show capacity for the large crowds. I do not expect Hollywood Boulevard, Sunset Boulevard, Plaza of the Stars, the outdoor stage seating area, or Delancey Street as part of Diagon alley queues. The Superstar parade takes place in this area and will cause issues with viewing areas. CityWalk will feature set queues for opening day. The use of the side Blue Man Group entrance is possible, so would using the remaining sound stages, if not in use for HHN or Impact!, for indoor queue area. 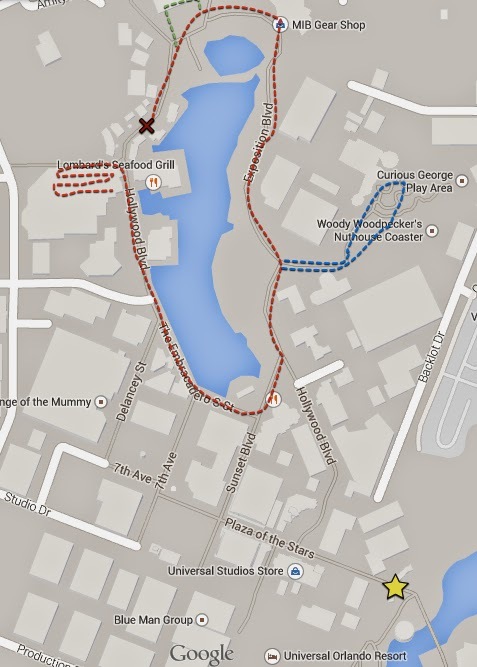 The queue should go around the CityWalk lagoon in a clockwise fashion, towards NBA City and Hard Rock. Ticketing System combined with exterior queues: Diagon Alley and possibly Hogwarts Express will use a FP style ticking system. Garage will probably be open at 5:30am, earlier, or even 24 hours before opening. Guests will approach Diagon Alley from either San Francisco or Worlds Expo to obtain passes for either attraction. A small queue will be set up on either side of the London facade: each one for stand-by and ticket return for Hogwarts Express (SF), and Diagon Alley (WE). A controlled interior courtyard queue around the Knight Bus and fountain before the Diagon Alley entrance show. CityWalk will feature set queues for opening day. The use of the Blue Man Group entrance is possible, so would using the remaining sound stages, if not in use for HHN or Impact!, for indoor queue area. The queue should go around the CityWalk lagoon in a clockwise fashion, towards NBA City and Hard Rock. With opening day, either system can be used. Due to the complexities and stress of an opening day, I leave option number one open since it's a significantly simpler system than number two. TouringPlans.com blog post by Seth Kubersky points towards a small cleared area between Fear Factor Live and Men in Black - Alien Attack where construction is taking place. Right now pavement is going down, but this could be the future location of ticket machines for Diagon Alley. Diagon Alley will probably use the ticketing system as outlined in plan two. Ticket locations will be located in the area indicated in the above photo. Guests will queue for a ticket, then come back at the indicated time. A stand by line will be offered, but not advertised until all tickets are given out. Because of this development I have struck out plan one above. Due to the location of the machines, it is likely Fear Factor Live, Men in Black - Alien Attack, and Simpson land attractions will be very crowded. Ticketing system has been installed and activated for Diagon Alley use. As the crowd surge subsides, I expect system number two will be used exclusively for the whole summer. Once guests arrive (not including early entry for hotel guests) they will be directed towards either end of the London facade the World Expo side of London to pick up tickets for Diagon Alley. A ticket for each guest will be given and guests will be told to show up within a window to get into the land. A short queue around the Knight Bus will be set up to hold the combined ticket and stand-by guests before experiencing the Diagon Alley entrance show. A short queue will be set up outside of the London area gates, and guests will be let into the land once their ticket return time has come. For opening day and the summer of 2014, the best choice for experiencing the land is to get to the park 45 minutes before opening, and once allowed in proceed up Sunset Boulevard, through Springfield to the London facade's north end to receive a ticket. While we have not had Universal confirmation, it is rumored that there will be a show scene featuring the famous opening of the brick wall to reveal Diagon Alley. This was a rumored sticking point with Disney and JK, as she refused to budge and Disney insisted it was a logistical nightmare. Disney's solution was to have multiple walls, but it appears Universal will only have one, large area for the show to happen. The show area is located behind the red, Leicester Square Station facade, as pictured above. The entrance to the show area is the opening where the yellow ladder is located. Guests will be queued up around the Knight Bus and the square fountain. Either pre-formed groups will be let into the show area (similar to the waiting room before the Stretch Rooms in the Haunted Mansion) or a queue will directly feed the show area (similar to Mission:Space's briefing rooms). Unlike at Hogsmead, this will break up the flow of guests, possibly causing longer waits immediately in the morning. It has been suggested the London facade might hold interior queues for the wall experience. I cannot repeat this enough, this is a rumored show and a rumored feature of the land. Even if planned to open today, this can change before opening, and the brick wall might simply be open constantly with some sort of other affect to show its movement. It is now believed there is no show to enter Diagon Alley, the interior queues are used for Leaky Cauldron. The big question mark for the expansion will be how Hogwarts Express will be handled. 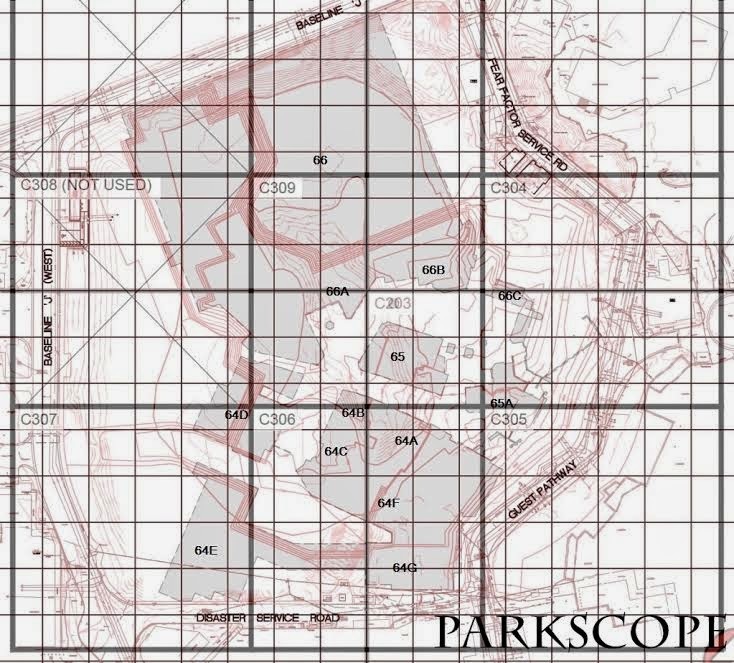 The attraction is predicted to have a capacity around 1,800 guests per hour split between two parks. This gives each park only 900 guests per hour capacity. Combine this with a complicated loading system, running into Platform 9 3/4, and it's no height requirement, I believe the waits for Hogwarts Express might be longer than that of Gringotts. Because of this, I expect Hogwarts Express to fully embrace its ride system and issue 'train tickets' to and from Hogsmead. There is already a ticketing station being built in IoA for their station, and incorporating the scanning of your admission media to make sure the guest has park hopping option before issuing a 'train ticket' to each guest. It's also possible that guests might be limited to only holding a Diagon Alley or Hogwarts Express ticket, not both. I do not believe that a general admission queue (like Forbidden Journey or any other standard attraction) is an option due to the limited space of the train stations. While not ideal, the easiest ticket will be for the return trip back to Diagon Alley. New information points not to a ticketing system for Hogwarts Express, but instead two lines: one for first time travelers that day, another for second/third/etc time travelers for the day. Standby lines for travel between Diagon Alley to Hogsmeade has now been set up in the extended queue/HHN area of Disaster!. There, as of now, is no extended queue set up for Hogsmeade station. As noted above, all these thoughts and ideas are based off of my experience, Universal's handling of prior Potter crowds, and speculation. The final handling of crowds, the capacity of the attractions, and more are not fully disclosed and still in the air. If you have any comments or additional thoughts, leave them in the comments section in this post. After scanning the permit site today, I came across a new permit for a VIP Lounge for the Wizarding World of Harry Potter - Diagon Alley. This will be going into Building 64D, which will also house Magical Menagerie and restrooms. It's unknown if this will be a lounge for real VIPs, or will be a passholder/American Express lounge like in the front of the park. As always, follow @Parkscope for news updates. We're back! This week we tackle the 'dedication' of SDMT in late April, Innoventions paint job, Muppets in World Showcase, parking price increases, KidZone rumors, Diagon Alley opening rumors, HYPE!, and your questions!